Hunters considering a hunting safari in South Africa may have questions about the medical care, hospitals, facilities and physicians available in the country. The medical care of South Africa can be described as excellent, provided, as in all countries, that the payment of medical bills is guaranteed. If no payments can be made, you probably will be refer to a state hospital. Most state hospitals have fair to good facilities and you will get all basic treatment there. However, private clinics and hospitals have some of the finest facilities anyone could wish for. Their rates will be higher, but their services will be excellent. Most tourists coming from abroad won't experience the medical fees of private hospitals as expensive, but it still may be the best to take out medical insurance for each member of the hunting safari. The outfitter will be willing to assist his hunters in finding the right clinic or hospital, but he cannot be held responsible for the billing due to injury or illnesses that may occur during or after the safari. The best hunting fields may be found in the remote parts of the country, but about anywhere in the country, a hospital will be available within an hour or two (driving at normal speeds) from the hunting ground. 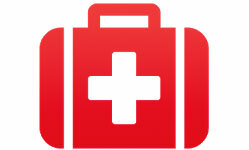 All outfitters and professional hunters are by law due to have knowledge of emergency care and all bush camps will have a fair and clean medical emergency kit available. South Africa has quite a number of professional aviation ambulances that facilitates doctors as part of the crew and operates all over the country. Patients that are critically ill or injured severely can be rescued by air anytime of the day or night if needed. Usually, some guarantee of payment is needed before the flight will be okay-ed. Your medical broker may be able to give you more information about this and it may be a good idea to enquire about the insurance rates that includes this kind of services. Endemic rabies areas are found, but it may occur in other regions as well. When bitten by a rabid animal, this virus can be contracted. Potentially, it can be fatal to humans. Animals that could be the source of the disease include stray cats, dogs, jackals, and some of the smaller mammals as well. But even Kudus have been found with it. Bats are seldom bearers of it. Be cautious when a wild animal turns into an unnatural tame one, or if a domestic animal turns into an unnatural aggressive one. Convulsions or paralysis of the throat muscles may occur in the animal (and dropping of the lower jaw) may be signs of it. Prevent a suspicious animal to come near any human. If an animal that is suspect bites a person, consult a doctor immediately. An injection against rabies may be all that is needed. If needed, the animal's brain can be examined at a veterinary laboratory. Do not take a chance with this one, for rabies is a horrible and fatal disease to humans. Although by far the most parts of South Africa is free of malaria, some of the best hunting areas does pose a malaria threat. Malaria are transmitted by certain types of mosquitoes (Anopheles spp.) Malaria isn't necessarily a fatal disease, but it can just as well infect the body in a deadly kind of cerebral or brain malaria. Most of the time, it is associates with the summer climate in the warmest lowlands of the country, although it sometimes occurs in wintertime as well. After a good rainy season, more of these mosquitoes may be active, causing a greater risk. In this case, prevention is better than cure. Different kinds of preventive measures are effective against malaria: first, preventive malaria tablets are to be taken BEFORE one sets of to a malaria area. It should be taken during and after the visit as well. But it isn't effective after the illness have started. Sleeping under mosquito nets, using one or a combination of mosquito repellents or aerosol insecticides will be quite effective against it. Wearing only thick clothes isn't a solid solution. Each mosquito bite doesn't mean malaria is to be feared! But malaria starts of as a typical case of influenza, developing into a grave sickness with symptoms such as high fever and heavy sweating. It can, most of the time, be cured, even if it is full blown malaria, but the doctor should be consulted if any suspicious symptoms occur after a visit to a known malaria area. Bilharzia is a slow sickness, less dangerous but it can cause the body to become quite weak over a period of months. Bilharzia is transmitted through infected water. Don't swim or wash in pools or even streams in bilharzia regions. One can prevent the disease to take effect by drying yourself after you've been into the water, as it take a minute or two for the parasites to penetrate through the skin. But drinking bilharzia water, or going into the water with an open wound in your body, will leave you unguarded. Purified or boiled water should be taken if thirsty in the bush. Normally, the water at the bush camp will not be infected at all. Chronic tiredness of unusual nature will be the clearest sign of this illness. Consult a doctor, for it can be treated medically. Contaminated water may house this disease in its depths. Cholera doesn't have the same effect in each person and can be transmitted from one to another person. Even healthy looking people may be bearers of the disease. Usually, the poorest people, who don't have access to purified water, are the most vulnerable to this disease. Symptoms like diarrhea, dehydration, weakness and muscular pain may be signs of cholera. The dehydration itself is a most dangerous aspect of the illness. Infected areas can be avoided, water can be boiled or purified and food can be prepared only in healthy water. Most hunters will be met with circumstances that don't pose a threat of any cholera infection. The African savanna is full of a tick-bite lesion that may spoil a first-time hunter's fun somewhat. Although not dangerous, a solid bite from this little creature causes pain after about eight days when your glands starts to swell, you experience some fever, headaches and nausea for a couple of days. Tetracycline treatment against tick-bite fever is effective, but you don't need to suffer in the first instance. It can be avoided by dusting your socks and lower legs, as well as your trousers with a carbaryl-containing tickside or repellant. Once you spot the brown little fellow on your body, removal in time may still save you the disease. But after a solid bite, you may be vulnerable to the disease. The good news then may be that you will experience immunity after the fist round of ailment. Your precious fun-time will be shortened somewhat, however. Thorough washing of your hands may save your live, once you've handled an infected carnivore, infected by the worm eggs of the Echinococcus species or by the tongue worm (Linguatula sp.). Or, as someone has rightly put it, a dead lion may be more deadly than a live one. This tape worm eggs stick to the coat of a carnivore and if you touches your mouth before washing your hands, even through a cigarette, the microscopic eggs can be ingested. After this, development of huge, fluid-containing cysts will occur in most organs, with great danger of their failure. Even surgery may not be successful. Therefore, wash your hands with care afterwards or use gloves if a carnivore, even one that is alive, is handled. Hunters of carnivores, posing for a photo with their pride lion or leopard trophy animal, game capturers, veterinarians or biologists are in danger of being infected. Even domestic dogs can be the bearer of it. So, go and wash that hands after the flash have clicked! Of course, many other diseases like tuberculosis, Q-fever, trichinosis, yellow fever, amoebiases and others exist. Some countries may prescribe injections before entering other infected countries. But none of these poses a real danger if one is well prepared and informed. Few dangers in the bush is as preventable as snake-bites: simply by looking where you are treading, you can minimize the danger considerably. Never put a hand or foot into a hollow trunk, rock, hole or nest unless you've double check it for possible snakes inside. Don't try to catch the snake. A bite to the hands is nearer to your vital organs. And some snakes that have the most dangerous venom may look like a non-dangerous one. Most snakes take flight when people arrive nearby. The pounding of feet on the ground may indicate to the snake that danger is coming. A good idea may be to take along a long wandering stick (kierie), which can be heard by the snake, and which can also be helpful to prevent the snake from biting someone. Polyvalent antivenom kits are available, but should only be use with very accurate knowledge of both the snakes and medical information. If you do have both, it is one of the best packages to take along! The sera are very effective, but if it is used incorrectly, it may be compared to being bit by ANOTHER snake! To take care of a snakebite in this way, you have to be sure what type of snake bit you. Try to identify the snake that you see as closely as possible. Although it isn't as critical as earlier (once you are at the physicians quarters) to know what type of snake it was, it still saves critical minutes to identify it beforehand. If you don't know, the doctor will only be able to react and can't work as pro-active as he would have wanted. Reading a good book or two about South African snakes will bring you in the picture of what kind of snakes you most likely may encounter. Your outfitter will, in all probability, have some of these. People affected severely after a snake-bite, amounts to only 10 % of instances. Over against the more than 140 species of snakes in South Africa, only 14 are poisonous. And snake-bites in South Africa is survived by 98 % of all instances! So there is some hope in the dark tunnel. What to do in case of a snake-bite? Most importantly: stay calm. This by far outweighs all other measures, for it will slow down absorption of the venom, cool down things and helps calculated decision making. Rather spend a moment relaxing, than jumping up and down in haste. Help the person to a shade, reassures him/her and see that panic don't sets in. Don't walk or moves far at all! Remember that the chances of survival, even if no medical help is given for quite some time, may be good to excellent. You do have reason not to panic. Look at where the pain is: maybe the snake's fangs haven't cut open the skin, in which case no problem exists other than keeping out of reach of the snake's second attack. Let the limb be stretched out in a relaxed way and keep it cool. -Don't bind a tourniquet around the leg to prevent any flow of blood as was advocated earlier. It may aggravate necrotic poisons. And don't cut the wound! Don't smear it with any chemicals or alcohol on it and don't apply suction on the wound. No fluids should no be taken, for vomiting may later cause him/her to choke seriously. DON'T USE OLD FASHIONED ADVICE! -If you do have a bandage available (pieces of clothing can also be used in case of a extremely poisonous snake), you are allowed to apply this firmly, but not too tightly, around a bigger area of the limb, starting from above and binding it down to the bitten area, if the venom came from a mamba or cobra. If, however, the bite came from an adder, do not pressurize the area of the wound. -Do throw some cold water or ice on the leg (and use something to blow it cold with if you can). This will also slow down the effect of the venom. -Mamba bites will start effecting the person within minutes, cobra bites within half an hour to a hour, etc. Therefore, only if there is no view of any help by a qualified medical person, and if the brochure of the serum was studied, a decision may be taken to give anti-serum by an unqualified person. (We mean live and death situations, amounting in great difficulty to breath, being totally alone in a far off place, etc.) The right serum may then be injected in the muscular part of the buttocks. Dosage for children or people of small build isn't smaller than for adult men. Don't give serum at all if there is any danger of serum shock (this is people treated previously with anti-toxins like horse serum), or only give it if antihistamine (Phenergan or Chlortrimeton) is available. A very slow injection of 0,2 to 0,5 ml adrenaline (1 in 1000) into the muscle may combat serum shock. Here, dosage for adults and children do differs). -After the serum was given, the patient still have to be hospitalized if bitten by a very poisonous snake. -Artificial mouth to mouth resuscitation must be done if breathing becomes almost impossible. It may even be good to ensure the patient that you will do it to him/her, thus making him/her more calm about the growing problem. The airways have to be kept open at all time. -Bites by a boomslang, vine snake or bergadder can't be handled by anti venom in usual serum kits, but can be taken care of by medical doctors. Cleaning it and putting on ice or cold water is the best to do. Although very poisonous, it yields more time to have the patient hospitalized. -Don't be fooled by an adder bite getting better after a few days. The limb may still be lost, even months after the initial treatment. Listen to the medical advice and go for the prescribed treatment. -It may be useful to take the patients pulse and respiration regularly, in order to make the best decisions and to know when to start with emergency treatment if no help is available. -Small bites from non-venomous snakes needs medical attention too, for infections may set in. -Remember the Lord's advice is only a prayer away!